Someone may noticed from other (social)medias that I also love to photography. The Olympus just released new Firmware update for Olympuksen OM-D E-M5 Mark II camera. And the main update was new Focus Bracketing feature. I decided to make video of it and of course I combined this with my knife-hobby. 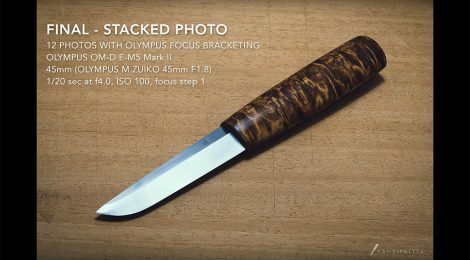 So here’s the result of my latest puukko-knife photographed with Olympus Focus Bracketing. On this short video you can see how 12 photos with different targeting is finally combined to one sharp image. You may find more specific information on video which incredibly beautiful music is made by Kai Engel. I have to admit that this feature is mainly designed for macro photography, but maybe this video outlines the idea even the target is little bigger.